There are two types of CDN Live services - with Pull Publishing and with Push Publishing. Please refer to Differences between pull and push publishing for more details. Go to Services → New Service → Live. Select Pull from the Publishing select box. 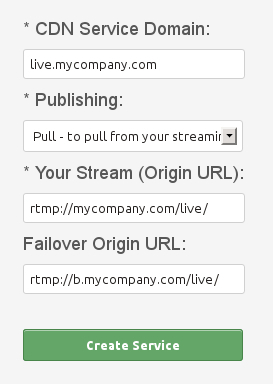 Fill in the RTMP Origin URL of your origin live stream and (recommended) Failover Origin URL as in the picture below. Please note that your origin live stream has to be published over RTMP protocol in MP4 or FLV container format and encoded with H.264 video codec and AAC or MP3 audio codec. In particular your Origin URL has to be in the following format. Please exclude stream name from your Origin URL as in the above example. If your origin stream is published over HTTP protocol then please refer to HLS streaming through a CDN Static service. Select Push from the Publishing select box. 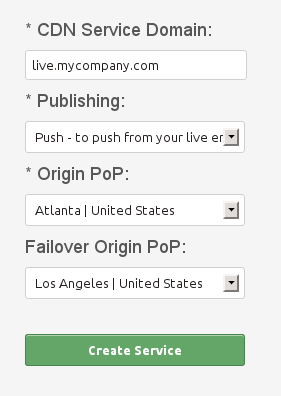 Choose an Origin PoP for Push publishing and (recommended) Failover Origin PoP as in the picture below. CDN Live service transcodes origin stream to 5 streaming protocols to provide compatibility with all devices, please refer to Supported CDN streaming protocols and formats for more details. Please note that you can stream multiple streams (determined by different stream names) through a single CDN Live service. CDN Live service does not transcode a single bitrate origin stream to a multi bitrate CDN stream. CDN stream is published in the same bitrate as the origin stream. Read how to simultaneously publish more origin streams and create a multi bitrate CDN stream. Please note that for transcoding to HLS and HDS protocols via CDN Live service with Pull Publishing it is required that your origin streaming server is Wowza. CDN Live service does not record live streams (DVR). Please note that except query string variables defined by Token Authentication CDN Live service does not support query string variables, e.g. http://12345.r.cdnsun.net/12345/_definst_/mystream/playlist.m3u8?myvariable=value.